Red Herring Dress size 14 In good condition From a smoke and pet free home Dispatched with Royal Mail 2nd Class. Thick cotton with large water colour floral design. New look TALL floral sleeveless dress size 14. Elasticated waist, woven fabric. Washed but never worn. Smoke free home. Seasalt . A really lovely piece from this desirable British label which is pre-loved and remains in excellent condition. The Seamstress dress is made from a thick cotton and features a cute abstract floral print in blues, greys and a touch of mustard. All over loveheart print. full front button fastening (top button is a loveheart). HENRY HOLLAND. retro look. lovely lightweight blue dress. 100% polyester. Mannequin used is size 10-12. SLEEVELESS DRESS WITH LACE UP FRONT FAUX SUEDE DETAIL. i am always happy to sort any problems. Pretty tea dress from Glamorous. Sky Blue with white little flowers, this sleeveless summer dress is really light, silky to the touch. Above knee length with pleated details at the waist. Back zip. Preowned but barely used, so it is in really good condition. Size 12 UK 100% polyester Pit to pit 16.5" Around Waist 27" Length ( shoulder to bottom hem) 30.5"
Monsoon Summer Fully Lined Cotton Tea Dress Size 18. Blue Floral Belted. Absolutely gorgeous blue floral summer dress by Monsoon in a tea dress fit and flare style with tie belt and hidden back zip fastening. The zip secures at the top with a hook and eye. Gunmetal grey beaded applique design to front v neck. Have only worn this dress a couple of times. Fully lined in cotton with cotton outer also so you keep cool. One of the beads is missing from the neckline, and there is a slight discoloration front left just above the v where the darker flower colour shows through the light blue. Smoke free home and happy to combine postage so please do look at my other items. FULLY LINED. LENGTH FROM SHOULDER TO HEM- 44 ins. NECKLACE NOT INCLUDED. Floral Midi Bodycon Occasion/Prom Dress - Only Worn Once - Size 16. Condition is Used. Dispatched with Royal Mail 1st Class. SIZE UK 6. NAVY BLUE - LINED - ZIP AT ONE SIDE. 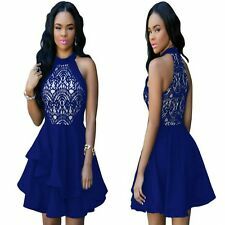 Ladies bridesmaid prom cruise cocktail tea short dress size 8 blue beautiful !! This is a stunning little dress originally worn as a bridesmaid dress (seen in photos) but could be worn for many occasions and very easy to accessorize. The fabric has plenty of body and is a bit like taffeta, gorgeous sapphire blue and pick up the light. 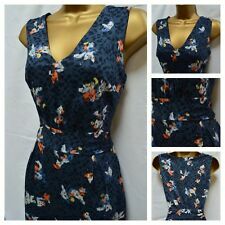 New Look Navy/Floral Tea Dress Used - Size 10 But Fits 8. Condition is Used. Dispatched with Royal Mail 2nd Class. Used only a handful of times and have been kept in the closet. Victims of my spring clean. Clean and ready to use. Good condition. Comes from a smoke and pet free home. This is a lovely dress from Emily and Fin. The fabric is blue with a dark blue, yellow and orange pattern. It is fastened with orange buttons down the centre of the dress. It can be dressed up or down. Beautiful Tea Dress. Fully Lined. Great Condition, but one of the teeth on the zip is slightly bent see last pic. Length 36". Beautiful flowery tea dress from Joe Browns, size 22. Double layer with a blue cotton underdress then a floaty floral overdress with a tie back for a good fit. BNWT Size 24 Blue Rockabilly/Vintage Style Sleeveless Dress by Lindy Bop. Sleeveless with round neckline and concealed rear zip, quite a heavy dress so hangs well. Fully lined, length from shoulder 43". Beautiful Turquoise Monsoon dress Size 16. Condition is Used but still very good Dispatched with Royal Mail 1st Class. 24” Underarm – Underarm (room for stretch). Length 40”. Full back concealed zipper. We do have cat ~ he doesn't smoke either >^. ஐ Ƹ̵̡Ӝ̵̨̄Ʒ ஐ. Worn a handful of times - Quiz Blue And Black Lace Skater Dress - Size 16 With Ribbon Fastening. Condition is Used. Dispatched with Royal Mail 1st Class. Pretty spotty dress from BHS. Dark Navy & white spotty design. Bead necklace not included. Length from shoulder to 40". Soft silky feel material which is fully lined. It is a lovley NWOT 'Chinoiserie' white, blue floral cocktail dress from Phase Eight in size 8. Length 99cm/39". I will always try my best to help. I do not accept retutns because the item not fit or changed mind. Monsoon Geometric Print Dress Floaty Summer dress fully lined Full Skirt Navy 14. Condition is Used. Dispatched with Royal Mail 2nd Class. Length: Approx 57” long from shoulder to hem.